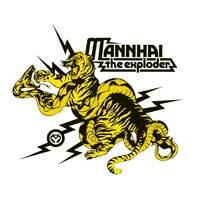 Well, Mannhai certainly are not as heavy as they used to be and show way more variety on this CD. It appears based on the reviews of the new CD on the web page that the band has made a classic rock record but still on the heavier side. It is for you to decide. Here are my thoughts! The CD opens with the heavy classic 80’s metal approach on Mr. Out of Sight. While Rock To The Top is a pretty lame commercial rock song, the band really demonstrates some cool riffs and ideas with the use of keyboards on Broken Chains. TNT Mountains starts with a slow slide guitar foot stomping riff and is a pretty strange tune with heavy riffs and piano that reminds me of Spiritual Beggars (a tiny bit). Cool song to break up the CD. Two Roads begins with the classic stoner rock riff and groove and some strange synth noises add to a slightly psychedelic vibe on this number. Behind The Trees starts as a standard stoner rock riff but really becomes a powerful ballad with cool effected vocals and wah-phaze guitars and a piano line as well. Error 67’ has this great vocal trading with a great female vocalist and has a hard hitting blues rock riff. A killer number! Head Against The Stones is more like the older style Mannhai material and a straightforward rocker. Black Water Swan is the bands doom anthem and closes the CD. In the end, I am quite impressed with the new Mannhai CD. A lot of variety and quite an excellent sound and a step in the psychedelic rock direction, which I always think is great! Visit the Spinefarm web site at: http://www.spinefarm.fi.